Although I’ve found that having imaginary conversations with my younger selves can give me a better perspective on the past, it does have some limitations. Because modern life is so busy and the human mind, by its nature, wanders randomly from one thought to another, sorting through bothersome memories whenever they pop up is not practicable. Even if it could be done, it wouldn’t be healthy to spend so much time brooding on them. My younger selves might not need long, detailed conversations, anyway—just a little bit of reassurance might be all right. What was the best way to go about it? A quick “It’s okay now” didn’t seem to be enough, even if it was literally true that the problem or worry no longer existed in present-day time. Something more substantial was needed to make that a solid fact in the shifting, unsettled realm of the psyche. I needed a visual image to go along with the words—a quiet, protected place where my younger selves could feel safe. Then it occurred to me that I already had imagined such a place when I sent my inner Cinderella away to start a new life in the abandoned village of Channelwood, from the old computer game Myst. I followed that up with another blog post in which she was joined there by Sara Crewe, another character from a classic children’s story. That imaginary village had plenty of space for a troubled younger self—or a few of them—to take a nice, restful vacation. 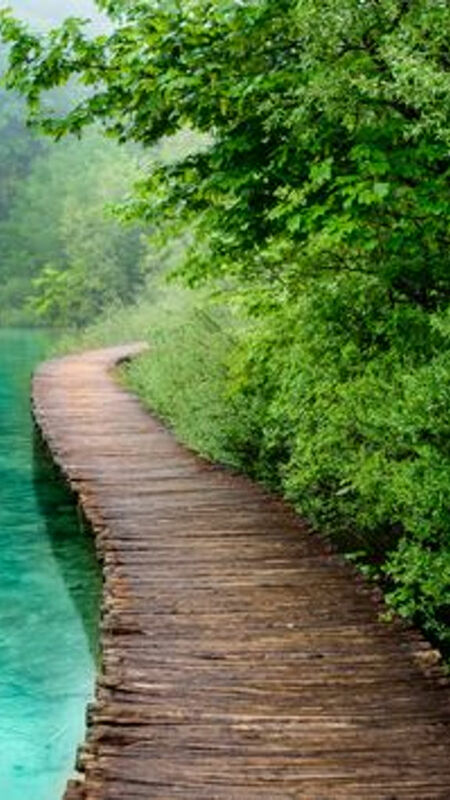 Long walks on the beach, or along the wooden pathways through the bayou, would go a long way to restore their spirits. When I arrived at the island, traveling on an old-fashioned sailing ship, I brought gifts for Ella and Sara, in the nature of practical household goods. The only item that had any decorative value was a calendar from a London shop, open to the current month—September 1897, which had a picture of horses pulling a farm wagon piled high with the fruits of the harvest. My other gifts were cloth and sewing supplies, sacks of grain, jars of spices, and crates filled with clucking chickens. We started trundling the supplies up from the beach in wooden handcarts. After we reached the shade of the tall trees in the bayou, I let go of my cart’s handles and turned to face the girls. Water trickled slowly down toward the sea, and a slight breeze stirred the treetops. There was no other sound but a few squawking chickens that seemed anxious to get out of their crates. Then I walked a quarter-circle clockwise until I was under a particularly thick part of the tree canopy where only the indirect light of early afternoon came filtering through. I turned to face outward again. I continued around to the west, invoking its late afternoon breezes and its winds of welcome change. In the north, I spoke of nightfall, of a cool rain, of winter and dormancy and a healing silence. Then I returned to my starting point beside the eastern shore and completed the circle by stating my intention that everyone within the village feel safe and protected forever. “And there is no need to fear being attacked because no enemies can enter here.” I paused for a moment because I wasn’t sure where to send my past selves’ enemies. Maybe they bounced off a protective bubble of white light? No, that wouldn’t fit the Myst computer game. Even an imaginary scenario like this needed a consistent plot. The girls listened politely, Sara with what appeared to be genuine interest, and Ella looking skeptical. When I had finished speaking, we all rolled our carts up to higher ground. After putting the grain and spices away in a shed, the girls started planning how they were going to build their chicken coop. “A few words before I leave,” I said, breaking into a discussion that quickly had gotten so animated that I wasn’t sure the girls still remembered I was there. Putting down the sticks they were holding, the girls looked up from the diagram that they had been sketching in the dust beside the shed. The girls turned back to their rough sketch of a chicken coop while the hens went on clucking impatiently in the crates. I said goodbye and walked back down to the beach where my imaginary ship waited for the return journey. When I boarded the ship, I moved easily and felt light and energetic, as if I’d left behind a few worries of my own that I had been carrying around without knowing it. Have you ever thought of writing a book? I love your stories! Honestly! I was just curious if that thought ever entered your mind.